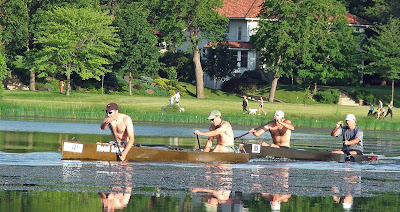 All photos were taken by Anna Peterson during the 06-19-08 Hoigaard's Canoe Derby. Thank you, Anna ! The lakes are full of milfoil. 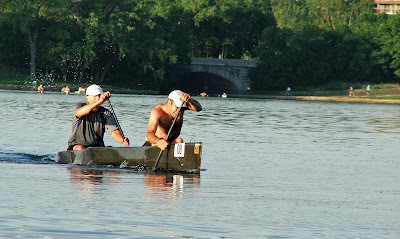 It sure makes racing in these conditions harder especially for the bow person. 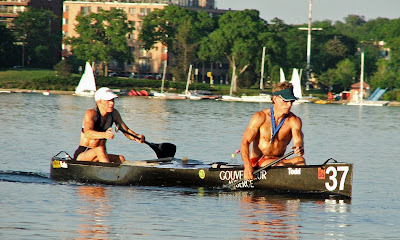 Tonight's race there was two equal parts, paddling and cleaning weeds off the bow. 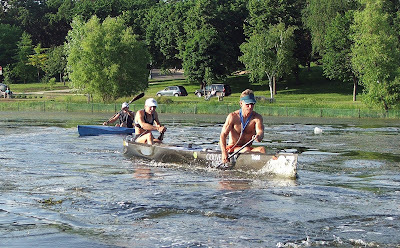 I was also reminded tonight why I don't particularly care to have kayaks racing with canoes. The first incident at the first buoy turn could have been another canoeist, but it wasn't. I won't get into the details here, but those racing in front know what I'm talking about. Then after the first buoy turn I was being flung water in my face with every stroke from the persons kayak paddle and not just a little water. I couldn't pass so I had to drop back to avoid this annoying occurrence. 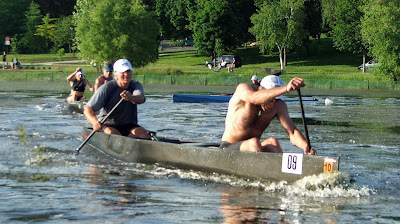 The winners of the Men's Division was Brett Arenz and Todd Johnson. Second Place in the Men's was Devin Arenz and Ed Arenz. Kate Ellis and I were first in the Mixed Division and third overall. I thought when we crossed the finish line I heard the time of 1:05:51, but when we received our blue ribbon they said the time was 1:07:51. I started to write the times for the other teams, but the new employees for Hoigaard's were having some difficulty in getting the correct teams in the correct divisions and some of the places were incorrect so I stopped. If they figure it all out and send me the race results I will post them. Todd Johnson, stern; Brett Arenz, bow. Ed arenz, stern; Devin Arenz, bow. Left to Right: Jeff DuBois, Al DuBois, George Stichler, Steve Yurista, Andy Gilbertson and Emily Peterson. Again, all the above photos were taken by Anna Peterson.